Ah, the crosstown routes. Famous for advertising themselves as “Limited stops”, when in fact, they’re not really all that limited. The CT1 epitomizes this by basically being the 1, except it doesn’t go all the way to Harvard and it doesn’t go all the way to Dudley. And I suppose it skips a few stops along the way. The bus rounding the corner onto Magazine Street. The bus arrived at the Magazine Street stop in Central Square about 15 minutes early, so we were sitting there for a while – I was the only one on board. “Look at that guy!” the driver suddenly shouted. “He’s smoking two cigarettes at once! Oh my God!” Was she talking to me? Was I supposed to respond? I couldn’t see the guy myself. I just sat there and stayed quiet. The driver then went to the door and struck a pose for a while. It was all kind of odd. Finally, with a few more people on board now, we left the busway. We instantly turned onto Mass Ave and made a stop at the rainbow shelter shared by the 1 and a few other routes. From there, we continued down Mass Ave, going by lots of businesses, some housed in multi-story buildings. The buildings got even taller as we went by industrial MIT facilities, then crossed over a single train track. After that, it got more leafy, and we passed some more standard university buildings. 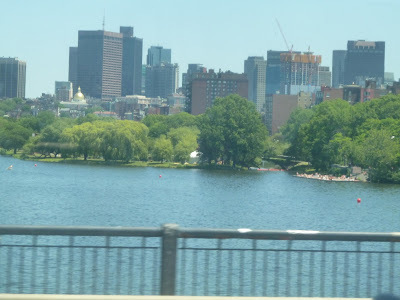 We reached Memorial Drive, and then crossed over the Harvard bridge, which offered a fantastic view of Boston. Speaking of which, that was where the bridge took us, and we entered the Back Bay on the other side. Now we were surrounded by beautiful old brick buildings. Considering the city was on the left and I was sitting on the right, this picture isn’t too bad. After we crossed over the Mass Turnpike and went by Hynes Station, the architecture became more modern. We passed the Mary Baker Eddy Library and the Christian Science Center, then Symphony and Mass Ave stations in quick succession. Now in the South End, the architecture was once again nice and brick. And right when the buildings got taller and more modern, we entered the Boston Medical Center, and everyone got off at Harrison Ave.
You’re only kidding yourself, CT1! Ridership: Well, in total there were about 25 people who rode, which is pretty good. But I’m pretty sure most of them would’ve been fine with either a CT1 or just a 1. Well, regardless, the route gets pretty good ridership, with an average of 2,191 riders per weekday. Pros: Well, I guess it’s a fine supplement to the 1. And on its own, the weekday-only schedule is pretty good – every 20 minutes rush hour, and every half hour during the day. Cons: But it’s the 1 we’re competing with here! That route a) runs much more frequently than this one, and b) runs on weekends. Plus, the 1 is longer. There were a few occasions on my CT1 ride where people would confusedly get on, only to be told the bus wasn’t going all the way to Dudley. Also, between the rainbow shelter at Central and Harrison Ave, the 1 makes 13 stops. Want to know how many the “limited stop” CT1 makes? Ten. It skips three stops. Nice try, CT1, nice try. Nearby and Noteworthy: Pretty much the same as the 1, but without Harvard or Dudley. This bus seems like a trick by the MBTA just to confuse people who want to take the 1. Did I mention that we were bunching with a 1 the whole time? It was behind us, so we got a lot of its riders, but does the CT1 really need to exist? It barely provides any sort of limited stop service, and it just feels like a short-turn of the 1. Maybe that’s what they’re going for? 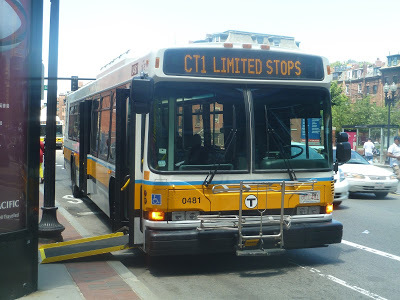 To be fair, the 1 used to make a few more stops, which were eliminated a couple years ago as part of the "key bus routes" project, so the CT1 made a little bit more sense back then. 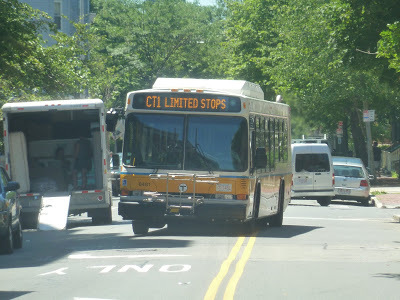 But now that the 1 also makes fewer stops, it might make sense to just run the CT1 as short-turns of the 1, or just get rid of the idea entirely and run a few more buses on the 1. I don't understand why anyone would take time to do this. But in all fairness, the time and effort does come through, nice job. 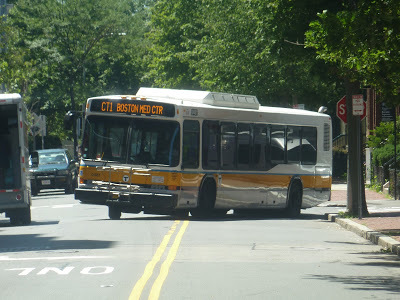 I saw a CT1 near the Mass Ave Orange Line station today. It was bragging about “Limited Stops”. You can’t fool me, CT1 (all thanks to Miles, of course! )!